I am not entirely sold on the idea that people need to take multivitamins if they eat right, but I give them to my children frequently despite my reservations. I feel that multivitamins can accommodate for days when my children don’t eat well (or I don’t cook well). Now, there is an organic multivitamin powder for kids made by New Chapter Organics. All kids need wholesome, safe foods that protect their growing bodies from pesticides, chemicals, and unknown risks from genetically-modified crops. 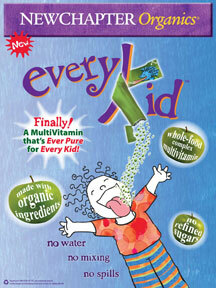 Nourishing young bodies with vitamins, minerals and antioxidants each day is equally important, because growing up is serious business.EveryKid whole-food complexed multivitamins are a great way to fill any nutrient gaps in kids’ diets, so that they build a lifelong foundation for good health. Nutrients are cultured in organic media that may contain: organic milled soy, organic yeast Saccharomyces cerevisiae), organic maltodextrin, organic gum acacia, organic orange and lemon peel – natural sources of bioflavonoids, organic carrot powder, organic alfalfa powder, enzymes and Lactobacilli (L. acidophilus, L. bifudus, L. rhamnosus). New Chapter Organics uses whole foods, rather than synthetic chemical isolates common in most other vitamin and mineral supplements. Cultured, probiotic, whole food nutrients are more readily absorbed by the body. I am glad there is now an organic choice for parents wishing to supplement their diet with vitamins. I like that it’s organic and vegetarian but, unlike the Rainbow Light Nutri-Stars (and Rainbow Light’s NutriStart multi-vitamin powder), this multi-vitamin does not include any minerals like iron or zinc. Good point Marla. Rainbow Light is also made from whole foods. Rainbow light is ISOLATES mixed with food. Food-Grown refers to a specific process of creating a food-like substance starting with a live culture of nutritional yeast, called Saccharomyces cerevisiae, which is combined with a USP vitamin or mineral in a stainless steel tank, along with a nutrient specific broth, such as alfalfa extract for vitamin K, citrus extract for vitamin C, and carrot extract for beta-carotene. The yeast feeds on these nutrients and transforms them in to a food-like matrix. At the end of the procedure, the yeast is sprayed with proteolytic enzymes to stop its growth process. The potencies of food-based supplements are significantly higher than food-grown because the final food-grown material is very bulky and creates large and expensive tablets. In order to have therapeutic quantities of nutrients in food-grown products, more USP nutrients would have to be added to the final mixture, creating a tablet that would be too large to swallow. Food-based formulas not only have much higher potencies of nutrients, they also are much less expensive than food-grown products. Food-based supplements are more shelf stable throughout manufacturing and distribution. Although Saccaromyces cerevisiae is a beneficial yeast and is safe for most people to consume, there are some very sensitive customers that would do better with a yeast-free product. Rainbow Light’s food-based vitamins are yeast-free. First of all lets look at some facts that New Chapter is not sharing with you. All Vitamin manufactures and New Chapter is included must start with USP in there budding or fermentation process so to say they don’t use USP iosolates is a lie. To there credit they are very good on the marketing and language used in marketing as are most wholefood and food based manufactures. For a company that espouses the “Whole Truth” they should give you full disclosure. When it comes to all the science on milligrams needed to get the action in the body it is quite high regardless of whole food or USP. I agree that you should be able to get all your nutirents from food but lets face it the average SAD Diet has us lacking not to mention metabolic inflammation that most people are dealing with. So we need both organic food sources as well as natural sources of supplementation. You are doing a great service of providing education to your clientle lets make sure it is accurate. Thank you for having a space to comment. Thanks a lot for the post; I really love to read articles which are about medicine especially about pharmacy. These articles keeps my updated about different topics and products that are related to pharmacy especially on multivitamins. I hope to read more from you! Thanks a lot and Kudos! Hi, Just wondering where I can purchase this product online. I was not able to find it at the New Chapter website. Thanks!